If you shop at Target with any frequency, you’re well familiar with the Market Pantry line of store brand food products. Up until now, the Market Pantry packaging has been rather generic, reinforcing the common practice of store brands looking plain as compared to their brand name counterparts. They almost always featured a red band at the top, the Market Pantry logo, a generic (and in some instances unappealing) hero shot, and bland typography. All of that has changed. I started noticing the Market Pantry rebranded and refreshed products in the store back in early spring, as I was in my Packaging Design class looking for poorly designed product packaging to redesign for my project. I actually remember getting excited about it, because finally store-brand products looked stylish, appealing, and not like something out of a generic supermarket experience from 1987. Target has chosen a revolutionary design approach to freshen up the brand. 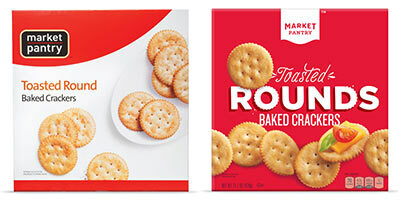 With the new design, all products have a red background, which ties the products together, and features the new Market Pantry logo, but the typography and design of each product varies, sometimes in fun and interesting ways. As part of the redesign, they often updated the photography to more exciting hero shots, thankfully replacing the often unappealing shots they previously used. The result is a varied-yet-cohesive look for all of the products in the line.